The main purpose of this study was to determine the influence of different types of surfaces on the sprint test results. 33 male football players from two age categories - U15 and U18 - performed sprint tests (7 distances between 5 and 30m) and a 150m shuttle run test on three types of surfaces: natural grass [n], a synthetic surface [s] and a rubber surface [r]. The longer distance a player covers, the more likely it is that the importance of the type of running surface will be noticed. The rubber surface diminishes the negative effects of changeable factors on the reliability of the tests and therefore, in our opinion, is recommended for control tests and especially for longitudinal tests. Comparing the results of running speed tests performed on different surfaces and especially in different weather conditions is unjustified. 1. Andersson H., Ekblom B., Krustrup P. Elite football an artificial turf versus natural grass: Movement patterns, technical standards, and player impressions. Journal of Sports Science. 2008; 26 (2): 113 122. 2. Ekstrand J., Timpka T., Hagglund M. Risk of injury in elite football played on artificial turf versus natural grass: a prospective two-cohort study. 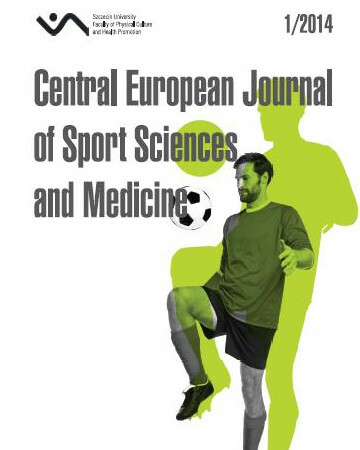 British Journal of Sports and Medicine. 2006; 40: 975–980. 3. Gains G.L., Swedenhjelm A.N., Mayhew J.L., Bird H.M., Houser J.J. Comparison of speed and agility performance of college football players on field turf and natural grass. Journal of Strength and Conditioning Research. 2010; 24 (10): 2613–2617. 4. Katkat D., Bulut Y., Demir M., Akar S. Effects of different sport surfaces on muscle performance. Biology of Sport. 2009; 26 (3): 285–296. 5. Müller C., Sterling T., Labge J., Milani T.L. Comprehensive evaluation of player-surface interaction on artificial soccer turf. Sports Biomechanics. 2010; 9 (3): 193–205. 6. Mujika I., Spencer M., Santisteban J., Goiriena J.J., Bishop D. Age-related differences in repeated-sprint ability in highly trained youth football players. Journal of Sports Science. 2009; 27 (14): 1581–1590. 7. Sporis G., Milanowić Z., Trajković N., Jaksimowić A. Correlation between speed, agility and quickness (SA Q) in elite young soccer players. Acta Kinesiologica. 2011; 5 (2): 36–41. 8. Stiles V.H., James I.T., Dixon S.J., Guisasola I.N. Natural turf surfaces the case for continued research. Sports Medicine. 2009; 39 (1): 65–84. 9. Yeadon M.R., Kato T., Kerwin D.G. Measuring running speed using photocells. Journal of Sports Science. 1999; 17: 249–257. 10. Zanetti E.M. Amateur football game on artificial turf: Players’ perceptions. Applied Ergonomics; 2009; 40 (3): 485–490.